Here are the children (and in many cases other family members) about whom I have written stories, based on information I have learned from my research. Click each photo to see an enlarged version of the photo, the full caption, and my story. The caption directly under each enlarged photo is mine, based on what I have learned. Below that, you will see Hine’s own caption (in italics), as published by the Library of Congress or other sources. You will note many examples where my research has resulted in name or age corrections, and occasionally, names of persons not identified at all by Hine. The stories often include interviews with descendants, and family photos of the children as adults. This is an ongoing project, so check back for periodic updates. 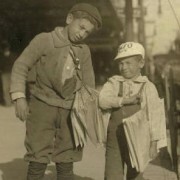 Below the photos, you will see “Tracking Down the Dallas Newsies.” When I began my search for the stories of these children, I kept a diary of all the significant events surrounding my search, and posted the diary on my website whenever their were updates. Looking back now, this research process is fascinating, full of serendipity, “eureka moments,” and plenty of dead ends. Reading it will give you insight on how I go about the task of identifying the children and finding living descendants. You can read it either before or after reading my stories. April 18, 2010 (1:00 pm): I have often wanted to take my readers through the research process as it develops in real time, and I have finally found that opportunity. As my research progresses, updates will be added. I do not know where my research will take me. However it finally turns out, readers will be able to share with me the up and downs, and the successes and failures that I encounter in the Lewis Hine Project. On April 17, 2010, I stumbled upon a blog called “Unfair Park” in the Web edition of the Dallas Observer, by editor Robert Wilonksy. 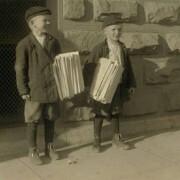 He had posted some of Hine’s child labor photos in Dallas, in this case, messenger boys. The boys were not identified in the captions, making it next to impossible to track down their lives. I logged on to the Library of Congress collection of Hine photos and browsed through the 19 pictures he took in Dallas. There were three that caught my attention, all of them of newsboys whose names were given. So I dropped everything and spent a good hour searching for information about these children. Here’s what I have found out so far. 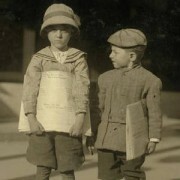 According to the 1920 census and other official records, the Kartis brothers were actually Rudolph L. Kartous and Louis J. Kartous. They were the sons of Tony and Fannie Katrous, immigrants who arrived in the US from either Hungary or Czechoslovakia in 1909. In 1920, Tony was working as a molder in a foundry. Rudolph was born February 10, 1906. Louis was born on October 22, 1904. In the 1930 census, Louis was married to Emily, and had two children, also Louis and Emily. He was a machinist at a foundry. Louis died in Dallas on March 5, 1978, and Rudolph died in Dallas on December 30, 1989. I have requested copies of their obituaries, which should help me locate living descendants. In the 1920 census, Odell McDuffy is living in Wichita Falls, Texas, with his widowed mother, Stella, and his older sister, Adelle. He is unemployed. In the 1930 census, he is still in Wichita Falls, with his wife, Donna (Mitcham), and his mother-in-law. They have no children. Odell is a grocery store clerk. So far, I have been unable to find any other information on him. In the 1920 and 1930 censuses, Sam (Samuel) Stillman was living in Dallas with his parents Hyman and Gertrude. By 1930, he was working as a bookkeeper for a clothier. He was born in Russia on December 7, 1907 (some records say 1906), and died in Dallas on February 14, 1993. I have requested his obituary as well. Louis Shuman is another matter. I have found no records of anyone by that name or a similar name, and about that age, in Texas or anywhere else. Perhaps Hine badly misspelled his name. But I haven’t given up. If I keep looking, he’s bound to show up somewhere. He may have died young. If you recognize any of these children, or otherwise have new information to contribute, please contact me at my email address at the bottom of this page. April 19, 2010 (8:30 am): I got up at 5:30 this morning and spent about 90 minutes before breakfast poking around on the Internet. I found lots of stuff. I found Odell McDuffy in the 1910 census, living in Fannin, Texas, with his parents, John C. and Stella McDuffy, a brother, Ethell (?) and a sister, Adell. His father is a farmer. According to FindAGrave.com, John Collins McDuffy died on April 1, 1912, and is buried at Belmont Cemetery in Fannin County. So that means that Odell was photographed about 18 months after his father died. I also found a family history posting on Genealogy.com from the granddaughter one of Odell’s older brothers, oddly enough named Othell. She gave her contact information, so I am going to send her Odell’s photograph. Finally, I found Odell’s Social Security death record. His full name was Collins Odell McDuffey, which explains why I couldn’t find it before. He was born on January 8, 1907, and died in Wichita Falls on June 17, 1987. However, his Texas death record gives his date of death as February 18, 1988. So I requested his obituary from the Wichita Falls Library, and gave them both dates. I may have found Louis Shuman, but I still have a long way to go. There is a Louis Schufman (or Schupman) in the 1920 census, living in Dallas. He was born about 1907, the son of Max and Becky Schufman, both born in Russia. Max is a junk peddler. They have seven children, the oldest three (including Louis) born in Russia, and the other four born in Colorado. This is interesting. There were a lot of Russian Jewish immigrant families who worked on beet farms in northern Colorado in the early 1900s, some who were photographed by Hine in 1916. This family may have been Colorado beet farmers before they moved to Dallas. The only other item I found was the California death record for a Louis S. Shaffman, who was born in Russia on January 15, 1907, and died in San Francisco on January 27, 1960. I requested his obituary from the San Francisco Public Library. Finally, my curiosity has gotten the best of me (again!). There are two other photos, out of the 19 in Dallas, where the children were named by Hine. There names were siblings Rosy and Exie Phillips, and a girl named Leila Prater. They weren’t newsies, but I decided to add them to this project anyway. I spent about 15 minutes on this, and I already have some clues. More about that in my next posting. April 19, 2010 (2:00 pm): I just got off the phone with Beatrice, the daughter of Rosa Mae Phillips. She had no idea about the photo of her mother and her Uncle Exie. This morning, I had found Rosa and Exie in the 1910 census, living in Dallas with their parents, John and Dicie Phillips, and six siblings. John was listed as a farm laborer, as were the five oldest children, including 10-year-old Rosa. She was actually 13 when Hine photographed her in 1913, and Exie was 10. On RootsWeb.com, I had found a posting by Beatrice, who listed some family information and was asking if someone had more information about her grandfather, John. She included her email address, but when I sent her an email with a link to the picture, it didn’t go through. So I looked her up in the Internet white pages and found her. She told me that Rosa married John C. Boone and died in Fayetteville, North Carolina on October 19, 1941. Beatrice was only seven then. I mailed her a copy of the photograph and plan to interview her soon. I also found Leila Prater in the 1920 census, living in Dallas in the home of a family for which she was working as a housekeeper. The census spelled her first name Lelia. She was born in 1895 in Georgia. The only other information I have found so far is a Lola Prater in the 1930 census, also born in Georgia in 1895. She is single, living in Atlanta, and her occupation is listed as servant. That’s it for now. It’s possible that Leila was an unwed mother, and somehow learned about this place while living in Georgia. On a tip from a posting on Genealogy.com, I contacted the Central Adoption Registry in Austin, to see if they have any records of Leila giving up a child for adoption. I am almost convinced now that the Lola Prater I found in the 1930 census in Atlanta is Leila. She was the same age, and even had the same occupation. It makes sense that she would have returned to Georgia. I searched Georgia death records and marriage records on Ancestry.com, but could find nothing on Leila. April 23, 2010 (6:00 am): I searched the Atlanta Constitution newspaper archives yesterday for Leila (Lola) Prater, but found nothing. I also checked both the Georgia and Texas birth records for people named Prater born between 1910 and 1913, looking for a possible child born to Leila, since she was living in a home for unwed mothers. I came up empty on that as well. I also check the Georgia death records, but she wasn’t listed. The Central Adoption Agency in Austin replied and could not help. So I am stuck at this point. I also did some further checking and found that Louis Shaffman, who died in San Francisco, was not the Louis Shuman photographed in Dallas. I found out that Shaffman entered the US through San Francisco, in 1931. I have found some interesting information about Sam Stillman. More details about that soon. I will be calling the niece of Rudy and Louis Kartous soon. April 24, 2010 (2:00 pm): It may be a while until I receive Sam Stillman’s obituary from the Dallas Public Library, so I got impatient and looked up all the people named Stillman in Dallas. There were six names with listed phone numbers. I spent about 15 minutes calling all the numbers and asking those who answered if they were related to Sam Stillman. Two people answered, and they weren’t related. For three people, I left a detailed message. One number is no longer in service. April 30, 2010 (6:15 am): One of the Stillmans I left a message for called me a couple of days ago. He isn’t related, but he was intrigued by my search. He told me about a Stillman family history website that lists hundreds of Stillmans. I contacted the webmaster, and he took an interest right away in my search and wants to be kept updated on it. I got the obit yesterday for Collins Odell McDuffey. He died at the age of 81. He was a retired tire dealer. He was survived by a stepson, Lee Welch, of El Camino, Texas. I have located him and will be calling him soon. One more thing on Leila Prater. 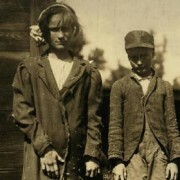 In his caption, Lewis Hine’s caption states, “See her story in Texas file.” I contacted the Library of Congress, and they found the Texas file, which is a detailed report by the National Child Labor Committee. But Leila Prater is not mentioned at all in the report. Too bad. April 30, 2010 (4:15 to 5:50 pm): I talked to Lee Welch, the stepson of Odell McDuffey. Predictably, he knew nothing about the photo. In a brief conversation, he told me that Odell was quite an amateur baseball player. He was a righty who was known for his knuckleball. I will mail out the photo to Mr. Welch tomorrow and call him up for an interview in about 10 days. I also talked to a niece of Rudolph and Louis Kartous. Her father was a younger brother of the boys. She has family photos of them. She is going to get me in touch with a daughter of one of them. She told me that her uncles used to participate in newsboy reunions. May 4, 2010 (12:30 pm): I received Sam Stillman’s obituary yesterday from the Dallas Public Library. Among his survivors were a son and grandson, both of whom I located right away. I called and talked to the son about 9:30 this morning. He hadn’t seen the picture before. He is a college professor and once taught a course in American photographic history, including the work of Lewis Hine, but he never knew, until now, that Hine photographed his father. I will be interviewing him. At 11:30, I interviewed Beatrice Earl, the daughter of Rosa Mae Phillips. We talked for a good hour. She gave me a lot of information, which I will add later. She had heard of Exie Phillips, but she knew nothing about him. May 7, 2010 (4:15 pm): I tracked down the phone number of a person in Texas named Exie Phillips, who is listed as being born in 1927. I presumed that there was a good chance this person was the son of Exie, who is in the photograph with his sister Rosa. I called, and Exie answered the phone. Sad to say, this Exie is a woman, and she is married to a man named Phillips. That’s a bummer. Such are the ups and downs of historical research. I just sent off a request for the obit for Rosa. Perhaps I will find some clues about Exie in it. May 9, 2010: (7:30 am): I found a posting on Ancestry.com about the family of Rosa Phillips. It listed her parents and siblings and a small amount of data on death and marriage records. It was not well sourced, but it’s all I have to go on. According to the data, Exie died in 1955; Rosa’s father, John R. Phillips, died in 1951; and Rosa’s mother, Dycie (or Dicie) Phillips, died in 1942. I have requested their obituaries. May 10, 2010 (4:00 pm): It’s been a full day. I transcribed my interview with Beatrice, the daughter of Rosa Mae Phillips. It was an emotional experience. After all, her mother died when she was seven years old, and she had never seen a photo of her mother as a girl, until I sent the Hine photo to her. She told me that Rosa married Frank Lamb in Arkansas at the age of 15, had three children by him, and all three of them died very young. She doesn’t know their names. Then she moved to Virginia and married again, in 1926. She doesn’t know if her mother divorced Frank Lamb, or if he died. 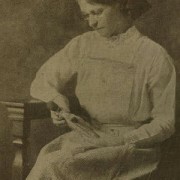 Her second husband was John C. Boone, who was only 19 when she married him. She was about 27. They had seven children, but five of them died very young or were stillborn. She has no idea what their names were or even if they were boys or girls. The only ones who survived were Beatrice and her sister, Elsie. Transcribing an interview is tedious, so I took a few breaks and did some research on this case. I found some amazing information, and I can’t wait to tell Beatrice about it. I found the death certificate online for one of the children who would have been a brother. He was stillborn in 1930, in North Carolina. I found her mother and her first husband Frank Lamb in the 1920 census, in Mooney, Arkansas. No children are listed. Also, in the Arkansas Death Index, I found three persons named Lamb who died in the same county (Arkansas County), in 1926, 1927 and 1929. Their dates of birth and their parents names are not given, but one of them was named Rosa Mae (Rosa’s name), and one was named Homer (Rosa had a brother named Homer), so I am guessing that these were the three children born to Rosa and Frank. I also found two persons named Frank Lamb who died in Arkansas, one in 1925 and one in 1936. I have requested obituaries on all of them, and I am going to call Arkansas County to see if I can confirm the names of the parents for the children. And one more thing – I found Exie’s death certificate online, as well as the death certificate of Rosa’s mother, Dicie. Exie was married when he died, in Ft. Worth, Texas. His occupation was listed as truck driver. As I said, it’s been a full day. I told her I would make copies of all the documents and mail them to her. Several hours later, I got an email from the Cumberland County Public Library in Fayetteville. It was Rosa’s obituary. May 12, 2010: (6:30 am): The first thing I saw this morning when I opened my email was a Google News alert linking me to Robert Wilonsky’s latest blog in the Dallas Observer. I have news alerts set for “Lewis Hine” and “Joe Manning.” Robert found another Hine photo of Rosa Phillips, a group shot with no names in the caption. There were 19 Hine photos taken in Dallas. I immediately combed through all 19 and found two more of Rosa, one of them with Exie. I usually search related photos for my subjects, but I’ve been so busy that I hadn’t gotten around to it. Thanks, Robert. I can’t wait to tell Beatrice that I’ve got some more pictures to send her. May 13, 2010 (11:30 am): Big news. I found Louis Shuman. As I mentioned before, I had found him in Dallas in the 1920 census, but that’s all. I had almost given up. I started searching this morning for his father, Max, and there he was, in the 1930 census, in Los Angeles, with his wife Rebecca and four kids, one of them Louis, who was working as an auto mechanic. That opened up the flood gates. A few minutes later, I found the family in the 1915 Iowa Census, living in Souix City. Max is a fruit peddler, and Louis is in school. They reported that they had been living in Iowa for one year, and in the US for 10 years. So when Louis was photographed selling newspapers, he was headed for Iowa a year later. They had been moving around a lot, in Colorado, Dallas, Nebraska (one of the kids was born there), Iowa, and Los Angeles. Max died in Los Angeles in 1940, and Louis died there in 1970. In the 1938 California voter registration list, Max was a listed as a butcher, and Louis a laborer. Subsequent voter registration lists show Louis as a truck mechanic, possibly married to Ruth. Ruth disappeared from the list in the early 1950s, perhaps due to death. I have requested Louis’s obituary. May 21, 2010 (5:00 pm): Busy day today. I interviewed Lee Welch, Odell McDuffey’s stepson. Lee was seven years old when Odell married his mother, so he was essentially raised by him. I will be transcribing the interview when I get time. Mr. Welch will be sending me some family photos of Odell. I received obituaries for Rosa Phillips’s parents, and the obit for Exie Phillips. He was survived by one child, identified in the obit as Mrs. J.V. Merry, of Fort Worth. So far, I can’t track her down. I called all the people with the surname Merry who live in Forth Worth, but none were related. I found the death record for an Andrew Prater, the apparent name of Leila Prater’s father. He died in Meriwether County, Georgia, in 1931. I called the local library and they found the obit, but it was just a death announcement, with no survivors or family information listed. There’s one more thing. I searched the Los Angeles Times historical archives for obits on Louis Shuman, his father and his siblings. Nothing turned up. One of his brothers, Solomon Shuman, died in Miami, but the Miami library could not locate the obit. May 24, 2010 (7:15 pm): Disappointing news. I thought I had found one of Solomon Shuman’s relatives. On one of the “people finder” websites, I looked up Solomon Shuman, and found a Miami-area phone number for him that was active in the 1990s. He died in 1996. When I called the number, a woman answered, and when I explained what I was doing, she confirmed that her husband was related to Solomon Shuman. But it turned out that this Solomon Shuman grew up in Philadelphia and was not the brother of Louis Shuman. So I am back to square one. With no obituaries for Louis or any of his siblings, it looks like I am running out of options. But I’m not giving up just yet. By the way, based on the census, the brother photographed with Louis was Morris. He died in California in 1955. I was not clear why his son’s last name was Bloom. However, moments later, I found his obituary also, in the same newspaper. It said, in part: “Mr. Bloom was a printer, who owned and operated Jaybee Offset Printing. He is survived by his wife Kay, a son, Martin, a daughter, Lynn and three grandchildren.” After several hours of non-stop research, I believe I may have found a phone number for Lynn. More on this later. June 7, 2010 (4:00 pm): I just did a telephone interview with Sam Stillman’s son, who lives in Baltimore. Sam was an accountant by trade, and was married to a licensed pharmacist. He loved sports, especially baseball and football. I’ll be posting his story sometime this summer. I may have come to the end of the road with Louis Shuman. I’ve tried everything I could think of, but I cannot locate his son, Joseph Bloom, or any other descendants. So I will probably write his story based on what I have so far. I will be posting it on this site, probably in a few weeks. June 8, 2010 (5:00 pm): I’ve had a productive day. I interviewed the daughter of Rudolph Kartous. Her father worked most of his life as a typewriter repairman. She knew almost nothing about her Uncle Louis Kartous, but after the interview, I did some more research and found a telephone listing for a Louis Kartous, living in Texas. I called him, and he turned out to be Louis’s 80-year-old son. What luck! I will be mailing him the Hine photo tomorrow. I am close to wrapping up my research. I’ve found living descendants for all of the children in the five photos except for Louis Shuman and Leila Prater. I have enough information about Louis to stitch together a decent, if brief story. In a last-ditch effort, I tried to get several well-known Jewish newspapers in Los Angeles to publish a story about my search, hoping that someone would recognize him, but neither newspaper was interested. In fact, one of them suggested I run it as an advertisement, which would have cost me $350.00. Obviously they didn’t agree with me about the historical importance of it. Louis was a Russian-Yiddish immigrant who probably led an interesting life, but the editor didn’t see it that way. As far as Leila Prater is concerned, I have almost nothing, and I seem to have run out of options. So I have several more interviews to do, and a few to transcribe, and then I am ready to write and post the stories I have uncovered. It’s only been 52 days since I got started on this, so things have gone pretty well. June 9, 2010 (2:00 pm): I just posted my story about Leila Prater. To read it, just click her photo above. June 29, 2010 (4:30 pm): I just interviewed the son of Louis Kartous. He told me his father worked most of his life as an iron worker. Most of my research work on the Dallas photos has been done. I still have to do one or two more interviews, transcribe all the ones I have done, and write the stories. July 9, 2010 (11:00 am): I interviewed Odell McDuffey’s great-niece a few weeks ago and just transcribed it. She had wonderful memories of him. July 14, 2010 (12:15 pm): Great news. I have completed my story about Rosa and Exie Phillips, complete with an interview with Rosa’s daughter, and many family photos. It’s a pretty sad story, but the daughter was very grateful I contacted her and sent her the picture. Click on the photo of Rosa and Exie above. September 28, 2010 (1:30 pm): I’m back with another completed story, actually two combined into one. It’s about Odell McDuffey and Sam Stillman. Click on the photo above. That leaves two photos left to go, The Kartous Brothers, and the Shuman Brothers. December 14, 2010 (4:45 pm): It took a while, but I just finished my story about Louis and Rudy Kartous. Just before I completed it, I discovered a huge surprise (a newspaper article about Rudy). You’ll see it in the story. Click their photo above. The only story left to do is the one about Morris and Louis Shuman. That’s coming soon. December 23, 2010 (1:30 pm): The saga is ending. I just posted my story of Louis and Morris Shuman. Click on their photo above. Unless more information turns up, I’m all done. It took eight months and six days, and I loved every minute of it. Thanks to Robert Wilonsky of the Dallas Observer for posting the Hine photos on his blog, and for his support along the way.